El Salvador – República de El Salvador, meaning literally the "Republic of the Savior"; original name in Nahuatl was Cōzcatlān – is the smallest and most densely populated country in Central America. It borders the Pacific Ocean between Guatemala and Honduras. It lies on the Gulf of Fonseca as does Nicaragua, further south. Its population of approximately 5.7 million people occupies 21,000 km². The capital city of San Salvador is the most important metropolis of the Republic. The only airport serving international flights in the country is Comalapa International Airport. This airport is located about 50 km southeast of San Salvador. The airport is commonly known as Comalapa International or El Salvador International. El Salvador’s history is rife with political conflicts and turmoil. A coup d'état in October 1979 brought Revolutionary Government Junta of El Salvador to power. It nationalized many private companies and took over much privately owned land. As a result of this, the country experienced civil war from 1980 until 1992, the ravaging effects of which can still be felt and seen in its people. Geographically, the landscape is beautiful in its diversity. El Salvador lies along the “Pacific Ring of Fire”, and is thus subject to significant tectonic activity, including frequent earthquakes and volcanic activity. Just beyond the capital city of San Salvador, the Santa Ana Volcano is currently dormant, but while it was still erupting it was very dangerous. Lago de Coatepeque, one of El Salvador's lakes, was caused by a massive eruption. El Salvador's tourism industry has grown dynamically over recent years as the Salvadoran government focuses its efforts on developing this sector. Its currency has been dollarized (U.S.) since 2001. Spanish; however, English is also spoken in the capital city, San Salvador. 115 volts, 60 cycles with 5 different types of plugs. The country’s capital city, San Salvador, has a number of large modern shopping malls, which stock the latest in international fashion and accessories. The most popular place for locals to shop in San Salvador is the Metrocentro, the flagship store of a chain of shopping centres in Central America. Three other newer malls that are popular are Galerias, Multi Plaza and la Gran Villa, which offer designer fashions. Most Salvadorean malls also include wonderful food courts that offer North American-style fast food. Not to be missed food-wise is a local specialty – the pupusa, the country’s unique contribution to Central American cuisine. For shoppers interested in purchasing fair-trade crafts and organically-grown produce and coffee, a local alternative market is held every other Saturday in the San José park in the San Luis area just west of the National University. Other small markets exist throughout the city and they carry a wide range hand-made local crafts. San Salvador is well-known for its nightlife. Clubs and bars can be found in the Zona Rosa, Basilea Mall, La Terraza (Sheraton Hotel), Las Terrazas (Multiplaza Mall), Boulevard de Los Heroes, Temptation Plaza, and the bars and restaurants area in La Gran Via (Mall and night lifestyle center). These places have many bars, discos, restaurants, DJ centers and boutiques. Visit the laid back bohemian bars (university crowd) around Calle San Antonio Abad to meet interesting locals or head to the Zona Rosa/Multiplaza Mall area to dance the night away with the city's style-conscious upper class youth. The average temperature varies between 16°C (from October to March) and 35°C (March-April), and rainy season begins in April and ends in November. Los Chorros is one of the major tourist attractions in San Salvador. Los Chorros is a series of large, refreshing natural pools fed by clear spring water from overhanging volcanic cliffs. Four pools are filled by water cascading down the thickly-vegetated slopes-almost like a Hawaiian jungle paradise. The forest reserve of Bosque El Imposible, so called because of the difficulty of traversing the mountain tracks to get into it. The reserve contains more than 400 species of trees and 1600 species of plants, some unique to the area. Birdwatchers may glimpse some of the more than 300 species of birds. Panchimalco is considered one of the last two remaining bastions of indigenous people or "Indians"" in El Salvador. 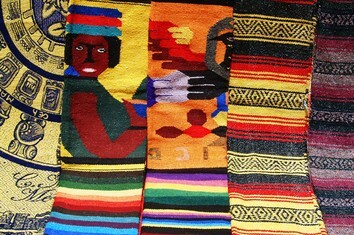 Villagers still weave and wear colorful native textiles and maintain many indigenous traditions. Nearby attractions include the town Los Planes de Renderos and Puerta del Diablo (Devils Gate)." The magnificent Montecristo Cloud Forest is located in the Montecristo-El Trifinio National Park. At an altitude of about 7000 feet, with plenty of rain, the forest has a number of micro-climates and a great diversity of flora and wildlife, including ferns, orchids, mosses, spider monkeys, anteaters, toucans, striped owls and more. Joya de Cerén is an archaeological site in La Libertad Department, El Salvador featuring a pre-Columbian Maya farming village preserved remarkably intact under layers of volcanic ash. It is often referred to as the "Pompeii of the Americas"" in comparison to the famous Ancient Roman ruins." Formed in a giant volcano crater the lake, at 15 km long, 8 km wide and 248 metres deep, is the largest lake in El Salvador and a popular spot for fishing, boating and swimming. A Turicentro is located in the village of Apulo located near the lake and offering restaurants, picnic spots and boating. Situated in the Sierra Apaneca Ilamatepec, Apaneca is the second-highest town in El Salvador, after Los Naranjos. It is also one of the more pleasant, with cobblestone streets, a cool climate and a mellow ambiance. Apaneca is perfect for those with time to spare and a soft spot for small-town life. La Palma is a municipality in the Chalatenango department of El Salvador. It has historical importance since it played a fundamental role as a site for negotiations and battles between guerrillas and the government during Civil War of El Salvador. Much of the municipality is mountainous and has a thriving artisan community. The David J. Guzmán National Museum in San Salvador, founded in 1883, is a general museum housing historical documents and pre-Columbian artifacts. The Natural History Museum of El Salvador was founded in 1976. The National Zoological Park in San Salvador, established in 1961, maintains a natural science museum.